Small, fun book to learn the history and basics of Braille. Introduces Braille alphabet and numbers. Has easy-to-follow, organized lessons, along with activities, exercises and puzzles. 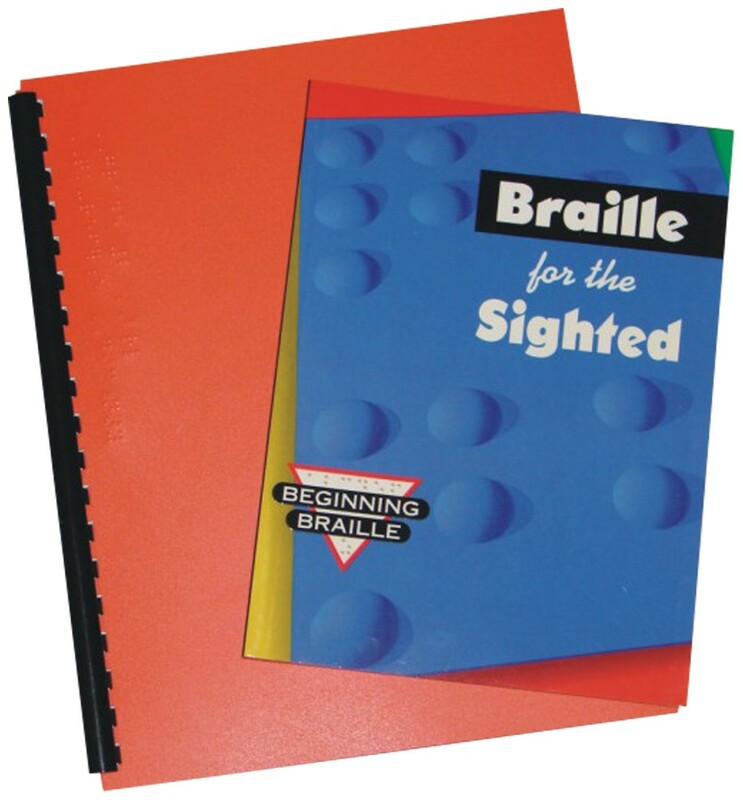 Package includes full-color print booklet and raised Braille companion book. Measures about 11 in by 9 in by 1 in. Have you ever wondered how Braille dots are organized so that blind people can read them with their fingers? Would you like to read Braille as a sighted person? If you answered yes to these questions, you (or your students) will love this package! Included is a fully-illustrated print book, called Braille for the Sighted. It begins by introducing you to the basics of Braille - summarizing the fascinating history of how it was invented, describing how you'd use a slate and stylus to write Braille, and so on. Then you'll be introduced to the Braille alphabet, and, step by step, you'll learn to recognize which dots make up each letter, how capital letters are formed, and how to write numbers in Braille. And of course, each lesson is jam-packed with fun activities, exercises and puzzles to help you master Braille - and enjoy doing so. But that's not all. You'll also receive a second book with this package - a Braille copy of Braille for the Sighted. Using the accompanying Braille book, you can practice closing your eyes and really get a feel for reading Braille by touch. And because all of the directions and exercises from the print book are reproduced in the Braille edition, you can even decide to complete a few of them entirely in Braille ... If you're feeling adventurous! In short, if you're sighted and curious about how Braille works, the print and Braille versions of this book are an awesome way to get started on the Braille trail!